Digital platforms remake our connection to the everyday, and have assumed an outsize role in aesthetic and political mediation. With these new players come new critiques. Yet platforms seem to be more than just new institutions; something else is there. How do we respond? Deep Lab, Protect Me From What I Fave, 2015. Courtesy Deep Lab. To question standards of objectivity in journalism is nothing new. Yet the recent resurgence of so-called “fake news” feels different. Whatever we think “fake news” is — whether a right-wing talking point or evidence of “foreign meddling” in our elections — the velocity of its impact relies on a digital media landscape that is more liable to algorithmic manipulation than any time before. Is the phenomena of “fake news” a side-effect of platform capitalism gone awry? Or are charges of “fake news” a tactic of nihilist political factions that stand to gain from the marginalization of institutions that once governed truth? 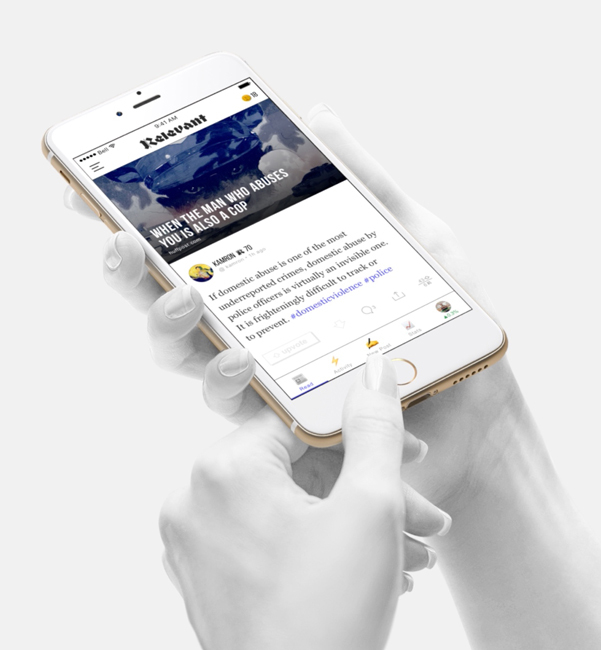 What follows is a conversation between Katheryn Thayer and Jeremy Fisher, two practitioners of journalism and user experience design, respectively, who sort through our crisis of truth after the advent of digital media. Jeremy Fisher: The internet in general and social media platforms in particular help create idealized conditions for “fake news” in a few ways. First, these platforms enable casual publishing. Any person, company, or institution can post something that is immediately indexed and searchable, in turn allowing anyone else to find snippets of often erroneous supporting material. Google’s PageRank algorithm is somewhat consensus-driven, but search results and social media platforms give identical aesthetic framing regardless of author or origin. Meanwhile, platforms are incentivized to addict users to interaction with a constant flow of information, and the arsenal of techniques used to do this — including microtargeting, segmentation, and the always-on feed — is more complicated and harder to disentangle and critique than previous eras of media received via print, radio, or television. Katheryn Thayer: Platforms like Facebook, Google, and Twitter initially spun a great story about data-driven meritocracy for news. It was an exciting, very American mythology of populism, fairness, efficiency, inclusivity, and opportunity. Your blog post might get more reach than something from a professional writer; small publishers could build a significant audience from scratch. No wonder we romanticized it. We have trusted these platforms because they do so often work really well. Google’s algorithms are great at organizing millions of answers to my lazy searches like “should I buy refurbished Macbook?” or “Greta Gerwig Barnard.” Facebook services (including the Instagram and Messenger platforms) attract our attention for an average of fifty minutes every day. Whether or not we think that’s time well-spent, we’re there. We don’t fully understand how it works, and yet we implicitly trust these platforms. The cost, of course, has been significant. It’s no longer just daily newspapers folding by the dozen. Digital alternatives are hurting, too. Combined employment at newspapers and internet publishers is down twenty-eight percent from early 2000 through early 2016. And in 2016, legacy players like Vanity Fair and The New York Times faced financial challenges — but so did hot upstarts like Buzzfeed and Vice. Meanwhile, we hear about partying Macedonian teenagers making small fortunes promoting fake news on Facebook and Google; we see those companies’ reluctance to engage in moderation or quality control; and we watch them collect the lion’s share of all digital ad revenue. These platforms have cannibalized media companies. The result is cheap content, disinformation, and, perhaps, a thrown election. JF: One of Facebook’s main innovations is the minimal trackable reaction of the Like button (which, beyond being a means of engaging, also acts as an antenna on non-Facebook pages used to gather browsing data outside of Facebook). All content is a kind of bait for attention, used to create analytic models and segmentations that in turn power algorithms. Editorial standards are anathema to this goal. A newspaper might tailor its messages towards a rough idea of its readership, but social media aims to be the pipes through which all sociability travels. It’s built to nudge you towards any sort of response and to foster conditions for you to nudge others towards responses. The model of the “long-tail” — typically used as a way to compare internet retailers like Amazon to their brick and mortar counterparts — is a useful metaphor for understanding how content and ideas exist on Facebook vs. print media. Physical stores with limited shelf space profit by selecting popular products and selling them at a high volume. Amazon — in addition to selling popular products — can sell near-infinite niche products at lower volume, with little added cost, generating equal or greater revenue. The structure and scale of these platforms inherently creates space for fringe ideas. Additionally, from a producer’s standpoint, it’s much cheaper to spread content when the entire distribution stack is given to you on social media. All you have to do is make the content. The long-tail distribution. Courtesy Jeremy Fisher. KT: Massive-scale advertising segmentation made it possible for bad actors and trolls to find their intended audiences. Notably, platforms have, up until recently, largely avoided the question of culpability. Around the 2016 election, Russian operatives reached as many as 126 million Facebook users (forty percent of the US population), sent 1.4 million Tweets, and uploaded over 1,000 YouTube videos. But even when called to congressional hearings in October 2016, leaders from these companies seemed intent on doing as little as possible to acknowledge the issues. Not a single CEO showed up. And the representatives who attended offered few explanations for bad behavior or proposals for improvement. “Do you believe that any of your companies have identified the full scope of Russian active measures?” asked Senator Mark Warner. “I have to say no,” answered Facebook General Counsel Colin Stretch. The ignorance is convenient. These companies would rather avoid the position of institutional arbiter, especially when ad revenue is involved. Up until September of this year, Facebook allowed advertisers to modify headlines on their shared articles and monetize any type of content they wanted. When Facebook says “We’re working on it” and proposes stricter rules for candidate-endorsement ads, the company neglects to mention that these rules only cover ads that mention federal candidates by name. “Issue ads,” which trolls used to stir arguments around topics like Black Lives Matter, gun rights, and religious affiliations, remain unregulated. And that “disputed” flag introduced to help warn readers about potentially inaccurate stories? It reduces the perceived accuracy of a story by 3.7%, according to a recent study from Yale University. So, when this feature is introduced, the “fake news” that hasn’t been flagged yet is trusted even more. (That same study also found that including publisher logos over headlines had no impact on accuracy judgements.) Facebook rejected these findings when they were published, but has since conducted research showing that disputed flags are ineffective, and may even incentivize clicks. A publication is an entry point to an entire complex of values bound up in its dramas and mythologies — and a reader likely chooses what to consume based on which narratives resonate — whether Democracy Now! or The Wall Street Journal. The conspiracy theorist Alex Jones, heralding himself as one of the lone defenders of “the West” and of masculinity against “global forces,” provides a narrative that could be especially compelling when considered in the context of the crises of masculinity induced by precarity and the looming challenges of automation. Carey notes that this is not a purely passive consumption: the ritual drama “invites our participation on the basis of our assuming, often vicariously, social roles within it.” Social media, with the performative consumption of liking and sharing, goes a step further in casting the reader in the midst of ritualized drama. Content on social media’s ability to scale much more broadly than print also means that fringe content and narratives have a higher chance of gaining traction. Communities can form around radical concepts with little friction — it’s difficult to imagine how this could have happened in previous eras of media. Product image for the Relevant app. Courtesy 4REAL. KT: And so if communities can form around radical concepts many of us find problematic, I don’t want to rule out the possibility for positive communities to form in their own ways again, either. We should be careful about asking large social media companies to crack down on conversations. Given how careless they’ve been with moderation so far, half-hearted efforts could likely block productive free speech. I don’t think Senators will question their way to solutions, either — the hearings didn’t seem to get them very far. But there is one government intervention I think could make a big difference: regulating monopolies. Alphabet and Facebook collect about half of all digital advertising revenue globally. Google, Facebook, Microsoft, Apple, and Amazon spent almost $50 million on lobbying last year to make sure regulations stay friendly. By breaking up these monopolies, we would create a more interesting media ecosystem. The one we have is broken. JF: It might be helpful to think a bit about some “internet-native” forms of information and their relationship to platform capitalism and fake news. The data leak is maybe one such accident ushered in by the era of networked big data. We’ve seen several leaks involving enormous troves of information over the past few years, several of which describe extremely complicated globalized technical and financial systems. Documentation of reporting on the Paradise Papers demonstrates some of the challenges of working faithfully with leaked material — the infrastructure of traditional media organizations is not designed to manage and report on material of this scale. The idea of documents held in secret and smuggled out plays to our distrust of institutions, to our belief that the truth is out there, and figures like Mike Cernovich have capitalized on this to promote conspiracy theories like Pizzagate. Folk reporting propagates through networks via coalitions of enthusiasts, who work piecemeal to create annotated cut-and-paste collages of original source documents, images, excerpts from forums, and calls to actions. These are open-ended works, unowned, authored by a loose or unorganized anonymous collectives, the most salacious of which tend to go viral. It’s impossible to imagine such a streamlined, crowd-sourced creation/distribution system existing on broadcast television, radio, or in print. With Carey’s ritual view of communication, it’s less surprising that someone eventually showed up at the pizza parlor with a gun. JF: It’s a prescient take on social media, where trolling and weaponizing memes context-free have proven to be a working strategy. Much has been written about exploiting these conditions with inflammatory content seeded and promoted by governments, PR firms, or just people looking to make a quick buck. The significance of this mass ceremony — Hegel observed that newspapers serve modern man as a substitute for morning prayers — is paradoxical. It is performed in silent privacy, in the lair of the skull. Yet each communicant is well aware that the ceremony he performs is being replicated simultaneously by thousands (or millions) of others of whose existence he is confident, yet of whose identity he has not the slightest notion. Furthermore, this ceremony is incessantly repeated at daily or half-daily intervals throughout the calendar. What more vivid figure for the secular, historically clocked, imagined community can be envisioned? Platforms, with hyper-specific segmentation, microtargeting strategies, and a radically different concept of physical space and time, engender a very different form of community, and are having their own impact on sociability and geopolitics. KT: Mark Zuckerberg has made incremental product tweaks, apologetic posts, and a New Year’s resolution about fixing Facebook. But I think we’re still figuring out the extent of the problems. It would be really exciting if Zuckerberg did for critical media artists what he set out to do for everyone on the internet: provide a platform. As Facebook is called to task for its impact on culture, I want to see it take a more active role in highlighting and promoting the work of artists who question the state of news and new media. I want to see Facebook resources devoted to both digital and physical exhibitions critical of fake news, from the Yes Men’s optimistic take on The New York Times to Deep Lab’s cyberfeminist Jenny Holzerisms (e.g. PROTECT ME FROM WHAT I FAVE) to 4REAL’s boutique social network, Relevant. Facebook could win back some of the credibility they’ve lost by supporting such work and responding to the critiques. This is unlikely, however, since platforms — unlike institutions — seem unwilling to engage in this self-reflexivity. JF: I’m skeptical of the potential impact of art here. From a platform’s perspective, art is more content to engage a targeted audience. “Fake news” is a symptom of much older, national dysfunction — racism, classism, unchecked corporate power — smuggled in and exacerbated under the guises of new “objective” technologies. KT: Yes, but the point that I am making is that platforms could engage with this work themselves. They could be the ones socializing it, giving it support, and helping more people encounter it. I know people are cynical about institutional critique. And it’s easy to give artists a platform to air grievances without really changing. But we need new ways of looking at these issues. Platforms have profited enormously from what we’ve discussed here. Artwork that visualizes this in some way would at least allow people to react. I guess it comes down to your faith in critique. JF: Part of the difficulty with critique is that we maybe lack the vocabulary and mental models appropriate for systems that operate at a scale beyond the human. Artists, writers, filmmakers, and journalists are all in a position to demystify, historicize, and create representations of these systems. I also agree with Benjamin Bratton’s call for speculative design to help actively imagine and model potential future technologies and relations with critical and political awareness. I imagine that the polarizing landscape of “fake news” will get worse before it gets better. Distribution and personalization will get increasingly sophisticated as platforms become more powerful. Content creation will shift in nature and scale as machine learning enables low-cost automated generation of video or photographs as viral fuel, potentially undermining the legitimacy of all images as proof, regardless of origin. We need concepts like Carey’s to help frame the strategic motivations and effects of this material without just naively calling for more fact-checkers. The shock of an uninterrupted flow of new information stokes inclinations toward tribalism and a retreat to the frame of what’s “natural” — whether that means “Making America Great Again,” rooting for the FBI to overpower the current administration, or longing for The New York Times to be the institutional arbiter of truth. Although I believe the onus to be on the platforms (or consumer protections dictating limits for them) rather than individuals, I’ve found it helpful to turn to writings from science and technology studies to interrogate my own assumptions about facts and fakes. Donna Haraway’s calls for new anti-essentialist mythologies and identities, untangling the knots of what appears to be natural, feels like a crucial tool for imagining a future that can withstand added complexity. Lorraine Daston and Peter Galison’s Objectivity situates objectivity as a historical concept, tied to scientific developments and image-making technologies, rather than an innate, universal given. Bruno Latour wrote “Why Has Critique Run Out of Steam?” partially in response to what he saw as conspiracy theorists co-opting critique. In his view, facts are shallow: “very partial, very polemical, very political, renderings of matters of concern” and he instead wants to create a space for the richness of scientific tools and practices as “gatherings” of materials, institutions, rituals, and associations. He believes a change in posture is one of the necessary steps towards achieving this, departing from a mode in which critical “tricks” are used to “lift the rugs from under the feet of the naïve believers” such that the critic alone is always correct, toward a criticism that is positive and additive, not to “debunk but to protect and to care.” I read this as requiring a sort of generous anti-tribalism and wonder how we might build digital platforms and institutions to encourage it.